Pictured is Aoife Durcan, posting one of the first letters into Santa's Special Postbox, with help from her Mammy, Sarah. 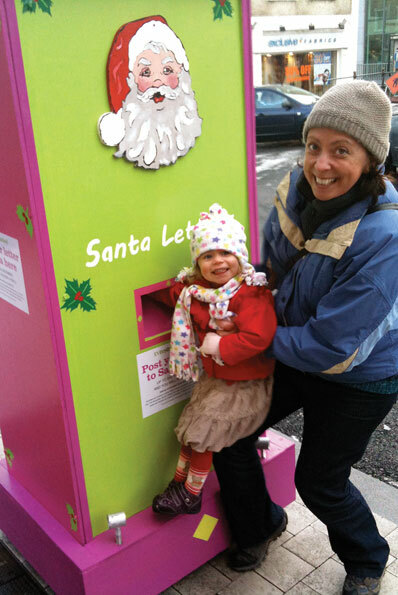 This special giant postbox for Santa's letters is located opposite the Linenhall Arts Centre/Gifts Supreme. Each letter posted on or before Sat 11th December, will receive a reply. Address your letter to 'Santa Claus, North Pole' - don't forget to stick on a postage stamp and be sure to include your name and address on the letter. Santa got lots of help from Mayo Arts Squad to help him make this, and he sends a big thank you to Mick and Graham. In assoc. with Destination Castlebar and Castlebar Chamber.